· Perimetry should be done in a room which is adequately large, free of stray light sources, quiet, well ventilated and with a comfortable temperature. 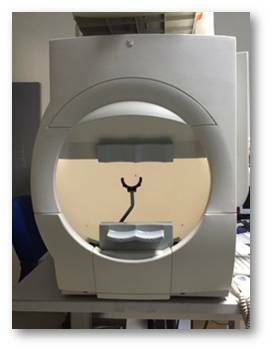 · An experienced technician/examiner should be present to explain the procedure and direct the patient to attempt the test accurately. 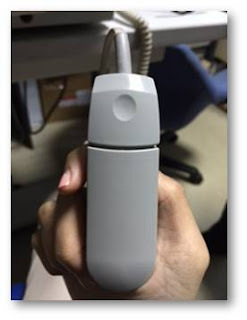 · The patient should be instructed to gaze at the fixation point, but can blink after pressing the button. The patient can pause the test by holding down the response button. · Some light spots are weak and others are strong. · Patient should be explained that some areas of the test may not be visible even to normal individuals. · Thick, opaque occluders can produce dark adaptation, which can change the apparent threshold values on subsequent testing. Complete occlusion can also cause disruptive interocular conflict which affects the test outcome. · Elastic band holding the occluder in place should not contact the upperlid. · Fixation and pupillary diameter should be monitored and documented. · Any difficulties/uncertain findings should be noted. 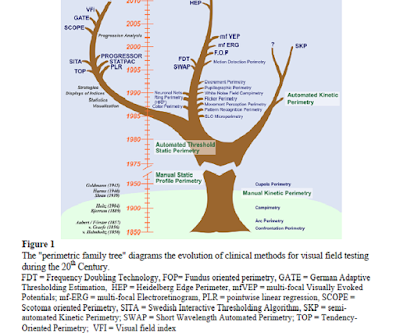 · Examination of the peripheral field (beyond 300) should be done without an optical correction. [However, contact lens users are allowed to wear them]. Examination of the central 300 of the VF requires the use of a proper correction for near with a thin frame lens. The lens should be positioned near the eye being examined to avoid lens rim artifacts. However, avoid touching the eyelashes. · Cylindrical ametropias of >1D should be neutralized. (The positive or negative cylinder which minimizes the thickness of the sphero-cylindrical combination of lenses should be used). · The view into the hemisphere of a perimeter is largely featureless and provides only a very poor stimulus for accommodation. To overcome this, a rather generous near addition is needed. Ask the patient if the chosen near correction allows a clear image of the fixation target. Fine adjustment is done by gradually adding additional plus power until the fixation spot is slightly blurred i.e until there is full relaxation of accommodation. A positive scotoma is one which is noticed by the patient (in comparison to negative scotomas which the patients are unaware of and are only detected on examination). An absolute scotoma is an area within a VF in which retinal sensitivity (perception of light) is entirely lost. A relative scotoma is an area of the VF in which retinal sensitivity (perception of light) is only diminished or loss is restricted to light of certain wavelengths. These areas retain some degree of differential light sensitivity. 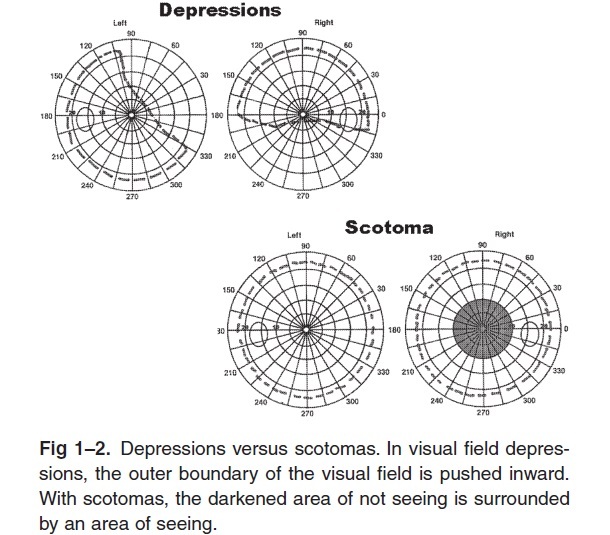 1.3 DIFFERENCE BETWEEN SCOTOMAS AND DEPRESSION: A VF defect is an absolute or relative decrease in retinal sensitivity extending from the edge of the VF. · The VF charts of both eyes should be examined side-by-side from the patient’s point of view: the left VF on the left and the right VF on the right. · Remember: The physiologic blind spots are located in their respective temporal hemifields. · The patient sees the deficit in the direction which lies opposite to its retinal location. · Concentric restriction suggests widespread loss of rod function e.g. nyctalopia (“night blindness”). A ring scotoma often appears as the earliest manifestation of these disorders. Loss of rod function may cause worsening of photophobia. 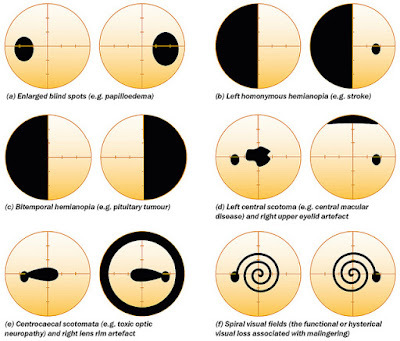 · Concentric defects can also occur due to: lens/rim artifacts, misunderstanding by the patient or malingering. (A confrontation test may confirm the abnormality). [In malingering: a “cylindrical” VF is seen that has a constant width at widely varying distances between patient and examiner]. · A general or diffusely irregular reduction in visual sensitivity is usually not due to structural disease, but caused by artifacts such as: incorrect refractions, media opacities, extreme miosis or by inadequate patient attention or cooperation. · Central scotomas= may cause blurred vision, reading disturbances, color deficits, photophobia, metamorphopsia and problems in facial recognition. · Cecocentral scotomas= Affect the central area of VF, as well as extend to include the physiologic blind spot. They are usually caused by toxic, nutritional and/or hereditary optic neuropathies. 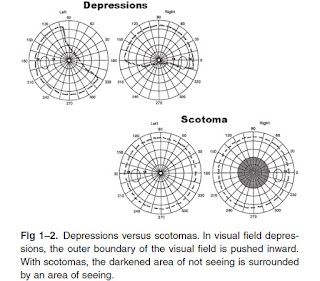 · Paracentral scotomas= A paracentral scotoma is an island of relative or absolute vision loss within 10° of fixation. · Sector- or wedge-shaped VF defects= (a) If the peak of the sector points towards the centre of the VF, it is liely due to disturbances in choroidal circulation. If the defect respects the vertical meridian: uniocular loss would suggest prechiasmal disease, bitemporal loss suggests chiasmal disease and homonymous loss postchiasmal disease. (b) If the peak of the sector points towards the physiologic blind spot, some form of nerve fiber bundle (NFB) defect is suspected, caused by damage to the nasal portions of the ONH. · The physiologic blind spot (BS) appears as an absolute scotoma with a horizontal width of ca.60 and vertically ca.90. It lies at an eccentricity of ca.140. About 40% of its area is above and 60% below the horizontal meridian. Abnormalities of the BS can include changes in its size, position or a combination of both. Enlargement of the BS can occur due to papilledema, uniocular disc swelling, peripapillary scarring or choroidal atrophy. Displacement of the BS to the temporal side suggests high myopia. A reduction in the size of the BS is uncommon (e.g. in developmental micropapillla). In hyperopia, the BS is smaller and displaced nasally. Cyclodeviation of the eye (4th CN palsy, skew deviation) may cause rotational displacement of the BS. · The retinal NFB (RNFB) defects follow the course of the axons of the retinal ganglion cells (RGCs). In the temporal retina the axons do not cross the horizontal meridian so that the associated defects ‘respect’ the horizontal meridian. The axons curve parallel to the vascular arcades producing arcuate scotomas in the superior or inferior hemiretina. · Nasal step= The nasal step can be a physiological sign of the anatomic and functional asymmetry of the retina. In that case it is of a small degree and interchangeable. Sometimes it is an artifact. It can also be a glaucomatous defect. It can be observed in normal visual fields and in other pathological conditions. · Usually isolated focal depressions of sensitivity appear in the arcuate fibers which merge with one another to form a fully expressed arcuate defect with nasal step. They finally “breakthrough into the periphery” leaving an absolute arcuate deficit. · Widespread RNFB defects may involve an entire superior or inferior hemifield and are referred to as “altitudinal defects”. RNFB defects can occur due to: glaucoma, ischemic optic neuropathy, optic disc drusen, chronic papilledema or retinal vascular occlusions. 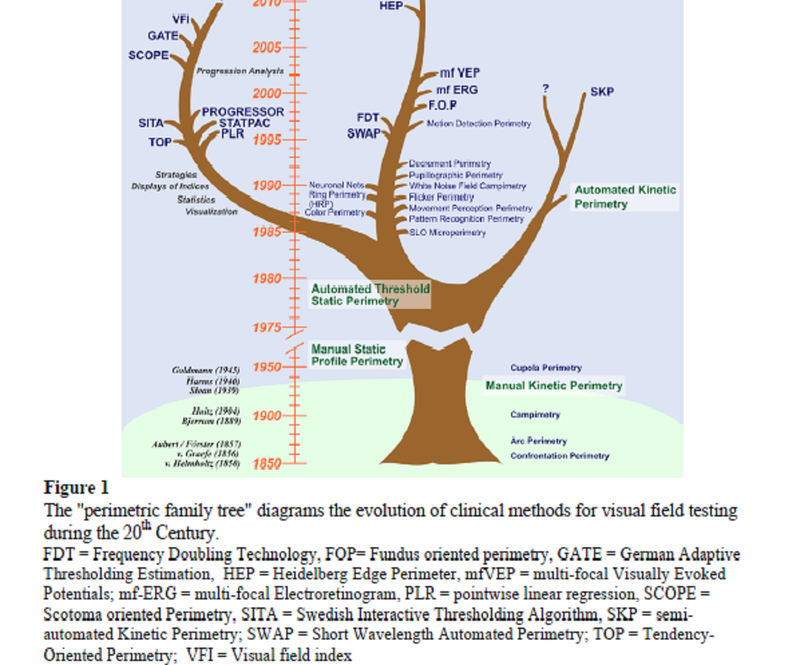 Total loss of function in the nasal quadrant with retention of an isolated island of vision in the temporal quadrant. · VF defects which respect the vertical midline indicate pre- or post- chiasmal lesions of the afferent visual pathways. Such deficits require neuro-radiological evaluation (CT or MRI). Pre-geniculate lesions may produce optic atrophy, unlike retro-geniculate conditions which have a normal fundus. · RNFB defects should not be confused with “refraction scotomas”. Posterior staphylomas and myopic deformations of the posterior pole can produce local areas of ametropia causing test objects to be defocused and leading to the formation of relative scotomas. they are usually located in the supero-temporal qaudrant, do not respect the vertical mid-line and can be reversed by appropriate optical correction. · Homonymous defects are caused by damage to the post-chiasmal visual pathways (optic tract, lateral geniculate body, optic radiations, visual cortex) contralateral to the field loss. They can affect entire hemifield of right and left eyes (complete homonymous hemianopia) or cuase subtotal degrees of loss (quadrantanopias). This usually occurs with lesions involving the inferior half of optic radiations in the temporal lobe producing a contralateral superior homonymous quadrantanopia. Less common are lesions affecting the superior half of of the optic radiations (usually in parietal lobe). Sector-shaped hemianopic defects can also occur. Homonymous defects in the paracentral regions are difficult to detect and indicate damage at the level of the visual cortex (when highly congruent). Damage in the most anterior portions of the primary visual cortex lead to monocular visual loss confined to the monocular temporal crescent in the contralateral eye. Some of the images were provided by Dr Ahmed and by Dr Joanne Marie Palikat.